F-TYPE Project 7, the latest model in Jaguar�s acclaimed F-TYPE sports car range, is set to make its debut at the 2014 Goodwood Festival of Speed on 26 June. F-TYPE Project 7 is the first Jaguar performance vehicle from Jaguar Land Rover�s Special Operations team, and will be produced in an exclusive, limited-edition run of up to 250 units. 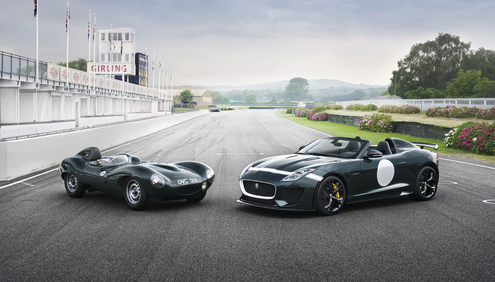 Its distinctive roadster body, introduced in concept form last summer, pays tribute to one of the most famous and iconic racing Jaguars: the three-time Le Mans winning D-type, which in 2014 is celebrating its 60th anniversary year. F-TYPE Project 7�s name pays homage to Jaguar�s seven outright Le Mans wins. F-TYPE Project 7�s power comes from Jaguar�s 5.0-litre supercharged V8 engine, now in 575PS/680Nm form, enabling the all-aluminium-bodied car � which weighs 1585kg � to achieve acceleration from 0-60mph in 3.8-seconds (0-100km/h in 3.9-seconds) and an electronically-limited top speed of 186mph (300km/h). F-TYPE Project 7 is fully road-legal, with a removable roof and 196-litre stowage space. Power is sent to the rear wheels through Jaguar�s eight-speed Quickshift transmission and second generation Electronic Active Differential (EAD). Carbon Ceramic Matrix (CCM) brakes, available as an option on the F-TYPE R Coup�, are fitted as standard on F-TYPE Project 7, offering powerful, consistent, fade-free braking. Another standard feature is Torque Vectoring by Braking (TVbB) which, working in conjunction with the EAD, enables extremely precise handling. Bespoke carbon-fibre aerodynamic aids and a unique suspension set-up enable F-TYPE Project 7 to deliver a truly engaging driving experience. While F-TYPE Project 7 features performance-focused engineering by Special Vehicle Operations � the engineering and vehicle division of Special Operations � its design has been kept true to the head-turning lines of the original Project 7 concept, which was unveiled last summer. The American International Automobile Dealers Association (AIADA) today released May 2014 sales figures for the international nameplate automobile industry. AIADA represents America�s approximately 10,000 international nameplate franchises whose brands accounted for 54.6 percent of all vehicles sold in the United States last month, and 54.5 percent of all vehicles sold year to date. AutoData Corp. estimates the seasonally adjusted annual rate (SAAR) for May was 16.77 million units versus 15.48 million units a year ago. This is the highest reported SAAR since February 2007. Sales for all brands, unadjusted for business days, were up 11.4 percent from May 2013 and 5 percent year over year. Good weather, low interest rates, and a favorable calendar, which included five weekends, combined to drive sales to their highest monthly total since July 2005. BMW (up 17 percent from May 2013), Honda (up 9.8 percent), and Toyota (up 16.5 percent), were some of the month�s big winners. Volkswagen saw sales fall 15.4 percent. Jeep and Mitsubishi saw the biggest gains in May, up 58 percent and 54.2 percent, respectively. In May, international brands sold 879,503 units, up from 750,328 in April and 847,047 in March. Asian nameplates occupied 46.2 percent of the U.S. market, up from 44.9 in April. European nameplates went from 9 percent of the market in April to 8.4 percent in May. Domestic brands held 45.3 percent market share, down from 46 percent in April. Read AIADA�s complete coverage of May�s international nameplate auto sales here. Details: Rail Europe, Inc., the largest distributor of European rail products in North America, is offering travelers $50 off a Eurail Global Pass or a Eurail Select Pass this summer. In addition, when you choose to book a Eurail Select Pass including France and a seat reservation in the same booking, you'll get one free domestic seat reservation in France. The Eurail Global Pass gives access to unlimited train travel through 24 countries with both continuous and flexible options for up to three months of European rail travel. The Eurail Select Pass allows travelers the option to choose from rail travel on the national networks of 4 adjoining countries with the choice to travel any 5, 6, 8 or 10 days within a two month period. Rail Europe, Inc., the largest distributor of European rail products in North America, is now giving travelers the chance to ride the rails in France this summer with the 30% Off: First Class TGV promotion. TGV premier tickets provide an added element of high speed comfort and convenience while traveling the French countryside including the feature of large comfortable reclining seats. This high-speed rail network connects over 200 cities within France, allowing travelers to discover more, zipping from city-center to city-center at up 201 mph. *Based on a flexible TGV ticket between Paris and Nice.